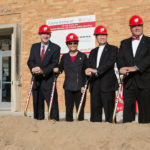 This $3,198,300 project is a 2,000 ASF / 2,200 GSF addition in the southwest corner of Engineering Hall for the Wisconsin Structures and Materials Testing Laboratory. The new lab room will provide a specially constructed high-strength floor and multi-story post-tensioned reaction wall with grid high-strength anchors, overhead crane, and access to the exterior that will allow for testing of structural components up to 40 feet in length. The overall height will match existing building height. Behind schedule due to nonconforming work.